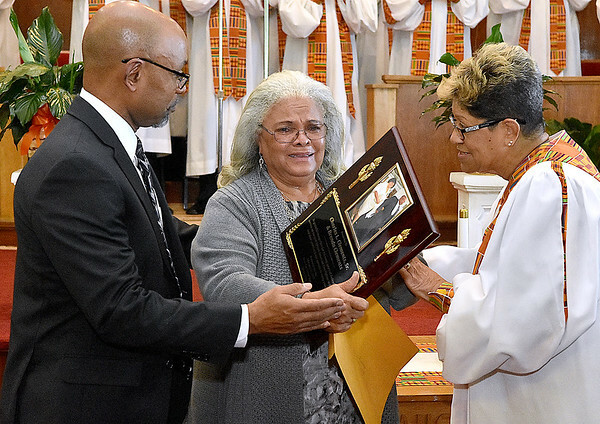 (Brad Davis/The Register-Herald) Brenda Clements (middle), widow of the late Beckley firefighter Charles Clements, holds back tears as she's presented with a special plaque by choir member Doris McCormick, right, honoring her late husband Charles Clements during Central Baptist Church's Black History Month celebration Sunday afternoon. Clements was the first African Amercian firefighter in Beckley and served over 20 years. He passed away in late January. Their son Charles Jr. helps to comfort his mother at left.